Hi there, my darlings! Here we are and it's another Monday...and it's FREEZING in New York! This weekend, I had the air on cos it was so hot in my apartment! Dear Lord, how odd is the weather lately! *grumbles* Anyways, let's distract ourselves from weird weather and Monday blues by drooling over new polish! 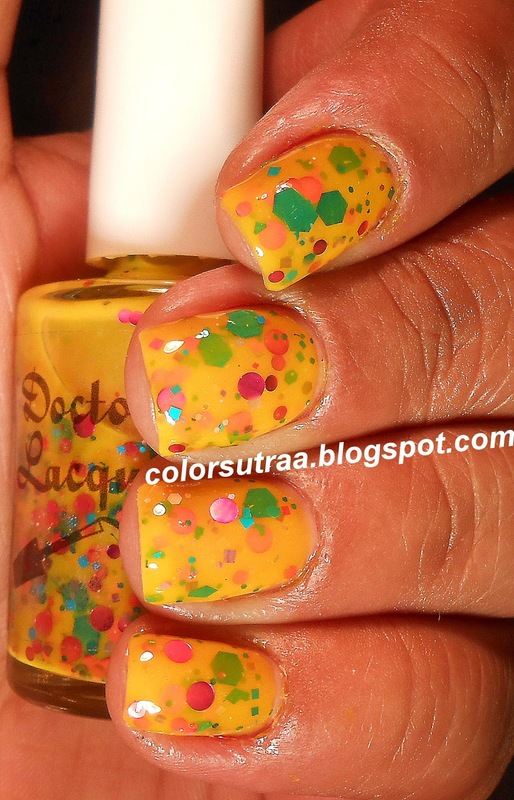 Today, I have a brand-new indie to introduce to you--Doctor Lacquer! I met Angelyn through a common Facebook friend and she so graciously offered to participate in my 1500 likes giveaway! Even though at the time Angelyn had no Facebook account and I had no Instagram account, our conversations were always easy and fun. Once I took a peek at her shop, I KNEW I had to swatch for her and she kindly sent over SEVEN for me to swatch! This post, I shall review for you 5 polishes from her Elements of Style collection! Being a scientist myself, you can imagine how much the inspirations for the polish and their subsequent names tickled me! Polishes named after chemical elements?! My inner nerd squealed in happiness! =D So, without ado, let's get right into swatches, shall we? First up, I have for you Fashion (Mg)azine--a pretty white crelly with small pastel hexes, squares and circles in blue, green, pink and purple. The formula and application on this was really great--the swatches below show 3 coats by itself on the index and ring fingers and 2 thin coats over 2 coats of Sinful Colors Wisp on the middle and pinkie fingers, topped with 1 generous coat of G&G's HK Girl. Magnesium (Mg), the element that inspired this polish, burns a bright white in a flame test. Isn't this sooooo pretty!? 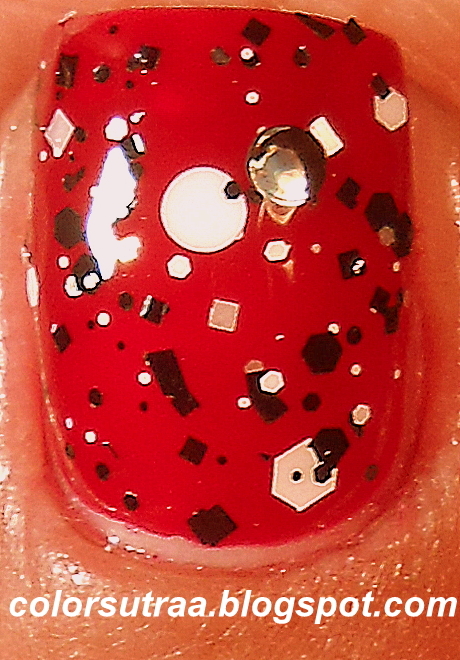 Next up, I have for you Haute (C)outure--a clear topcoat with black and white glitters in squares, hexes and circles. Again, no issues with the formula and the swatches below show 2 thin coats over 2 coats of OPI Got The Blues For Red, topped with 1 generous coat of G&G's HK Girl to finish the look. Carbon (C), the element that inspired this polish doesn't have a distinctive color in a flame test but is black in its graphite form and white in the form of diamonds. I love the contrast of the black and white over red! 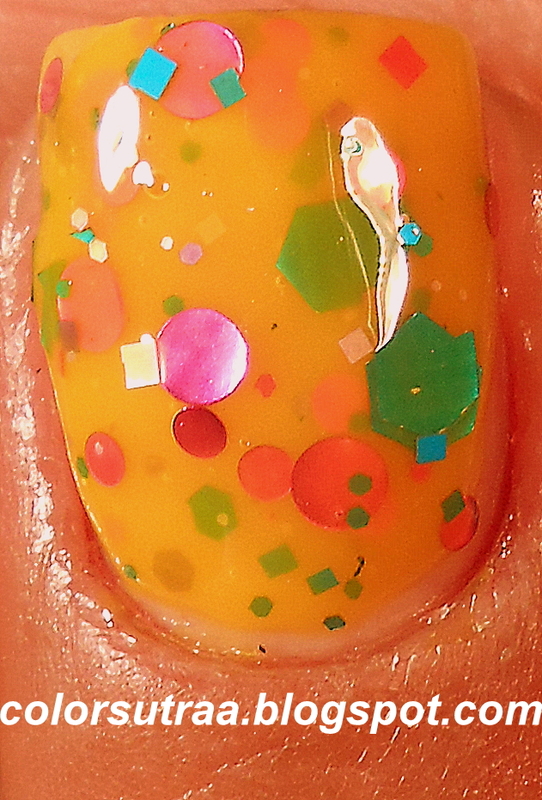 The third polish I have for you is (Na)tural Beauty--a vibrant orange jelly polish with various sizes of green, fuschia, turquoise and yellow glitters in squares, hexes and circles. No issues with application or formula and the swatches below show 3 coats on its own, topped with 1 generous coat of G&G's HK Girl. Sodium (Na), the element that inspired this polish, burns a bright yellow in a flame test--would you rock this bold shade? Next, I have for you The Perfect (Li)pstick--a gorgeous pink jelly with neon stars, hexes, squares and butterflies in various sizes. I had no complaints with application or formula and the swatches below show 3 coats by itself on the index and ring fingers and 2 thin coats over 2 coats of Barielle's London High Tea on the middle and pinkie fingers, topped with 1 generous coat of G&G's HK Girl. Lithium (Li), the element that inspired this polish, burns a bright crimson/magenta in a flame test. I absolutely love this polish! Last but definitely not the least, I have my personal favorite, Who Did Your Mani(Cu)re--a beautiful light blue crelly with fuschia, gray and purple hexes and circles as well as silver holographic butterflies. No issues with application or formula and the swatches below show 3 coats by itself on the index and ring fingers and 2 thin coats over 3 coats of OPI What's With The Cattitude? on the middle and pinkie fingers, topped with 1 generous coat of G&G's HK Girl. Copper (Cu), the element that inspired this polish, burns a bright blue in a flame test. Gorgeous, right? So there you have it, my darlings! 5 polishes from Doctor Lacquer's Elements of Style collection! Check out these and the rest of the collection on her website HERE for the FAB price of $8.49 for a full-size, 16.5 mL bottle! 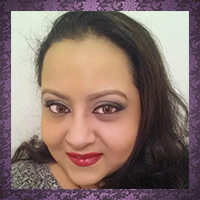 You can also follow her on Instagram @doctorlacquer for the latest updates OR let's show her some love on her new Facebook page--either way, tell her ColorSutraa sends her love! Like these swatches? STAY TUNED for my review of 2 more Doctor Lacquers, this time two gorgeous thermals, to be posted soon! 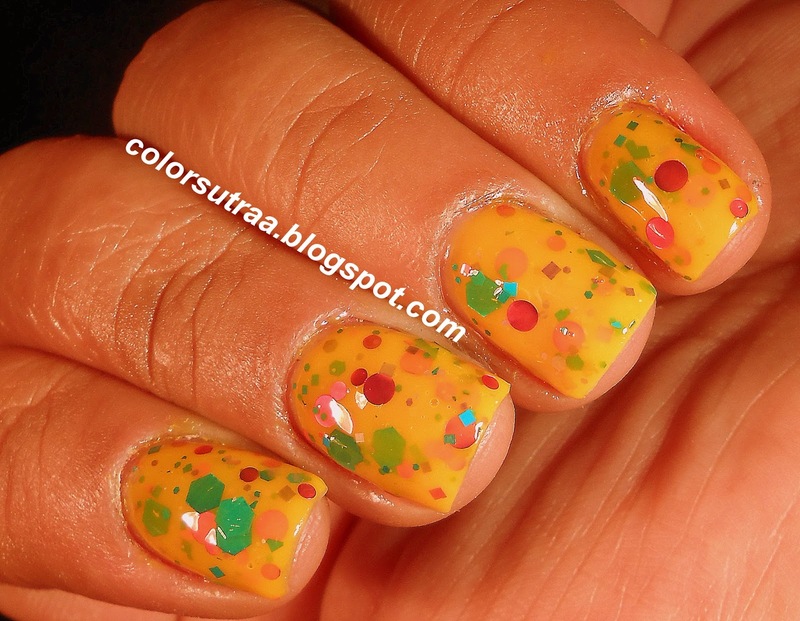 What do you think of these polishes? I always love to hear from you in the comments section below!